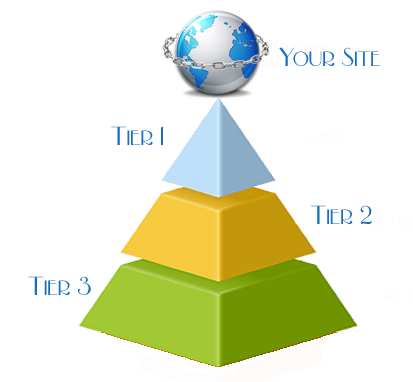 SEO - Tier 1 vs Tier2 and Tier3 Links You know what, I very rarely do tier backlinks anyway which may seem odd considering that most people advise to do them. What I basically do after panda and penguin, is focus on 2 main strategies. Relevance, and social links. These have worked wonders for me. In my opinion tier backlinks especially anything after the second tier is pretty much useless these days. Why? Because the reason we built multiple tiers in the first place was to "empower" or "pass more link juice" to the main links pointing to our sites. Post-panda and penguin, everyone is now putting 10x the effort into link quality and almost completely ignoring quantity. I rank new sites within about 3 months for medium-hard, sometimes even HARD competition keywords with like, around 200-500 links. But these links already come from super quality, super relevant websites. Guest posts, old and established web 2.0s, a little bit of social bookmarking..etc. The reason I say tiers are pretty much uselss is that people are now ALREADY looking for much higher quality links as first tiers which means you'd rarely need to "empower" them with second tiers and all. Others might disagree and have different opinions and results, I do not claim that tiers no longer work or are a complete waste of time, just laying out how I do things these days and how they work for me. -Next, would you like to read more about SEO or more about the BLOGGING?